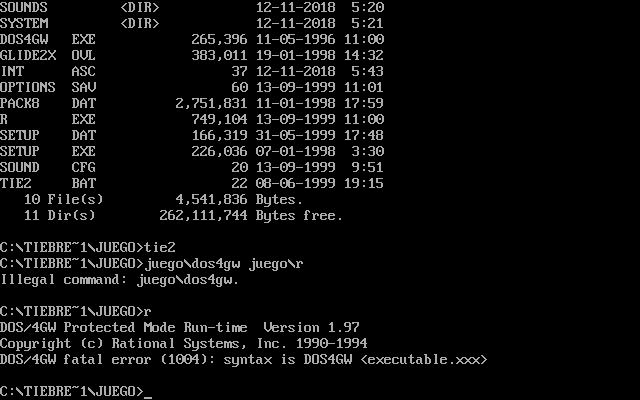 For this I have used both DOSBox 0.74 and the SVN Daum version testing all possible configuration options. Does anybody know what is it due to? Thanks in advance. It looks like the batch file is referencing a directory that does not exist since you are already in that directory. Also you are using LFN directory names. I'd delete the game and install it from the original copy. The latest official version of DOSBox is 0.74-2. We don't care about the daum version here. That is what I have done. I have installed the game from its original copy four times and it always throws the same error. What I forgot to say is that the game only has a Windows installer even though the executable is for DOS. I mean, I have to install the game through Windows and then run it via DOSBox. Not sure what's going on there, but based on how the directories are organized it seems you need to make the TIEBRE~1 directory the current directory and then start the game from there.